I belong to family where main source of income is cultivable land. I am not affluent and wealthy. Despite that I was keen to make it to a US College. Even the counselor at USEFI was positive about my abilities. But big question was how I am going to finance my studies there. Finding a job was one option but in my case it was like what if I won’t a get a job there. Personally to me real guidance was first hurdle. There was almost none who can guide me about Universities and Colleges in the United States. Only thing that was my Guiding Source was SAT Hand Book and TOEFL Hand Book. Finances were my main worry and I gave up in the hope of “perhaps in the future”. Despite working for 15 plus years in the ITeS I don’t have funds to go to a US University for a course. But yes, I have enough information to guide teens and young students. Internet is a blessing for me and perhaps for you too. Today, I offer career guidance through this blog. No, I am not a certified career counselor but I have huge experience of searching institutes and written millions of pages till date around Education in India and Abroad. I sell my writing to feed me. Finding information is one thing. Finding viable information that works for you is not just another thing, it’s a serious business. So you do not burn mid night oil in search of a college, university, institution, scholarship & resources and focus on your studies I publish this blog. 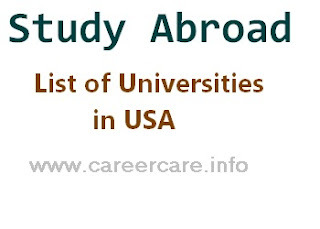 If you are looking for Admission into a College or University in United States (US), here are three key sources. Click on any of them to find a best fit institute for your needs. Do you have a career question?? Ask Me!! !